Pokemon (short for Poketto Monsuta, Japanese for Pocket Monsters) began life as a video game originally designated for the Nintendo Gameboy. Its creator, Satoshi Tajiri, was inspired by his childhood hobby of collecting insects. Throughout Pokemon’s tenure as a video game, trading card, manga, anime, and now, cell phone app, the theme of creature collection, training, and combat matches has remained the same. The original creatures designed by artist Ken Sugimori have been added on over the years, so 809 of them are available now, in different generations. Despite their deadly powers, most of the creatures have a sweet, childlike look, a legacy from Satoshi’s original conception. Some fan artists, however, have taken to depicting them as “real” animals, such as the illustration of Garchomp above. 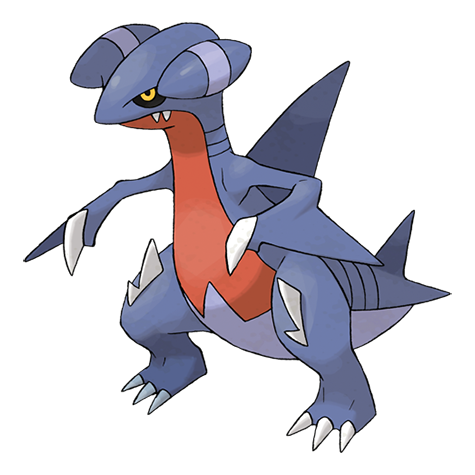 (The original Garchomp is here.) Such retcons take pokemons into the realm of recent kaiju movies, such as Pacific Rim. Traditionally, pokemon names are childlike as well – Flaafy, Hoothoot, Jumpluff and Sneasel, to name a few – and it is this quality I attempted to randomgen here.